I was inspired by the fashion boots on the MFP web site the challenge to day was fashion with boots. I like the flowers on the blue boots. Check out their Inspiration challenge #47 and play along. I had a little bit of time to play with some new stamps and join in on the challenge Simple Salutation found on MFP web site. I used my new favorite washi tape from Stampin Up! Another bight pretty card. 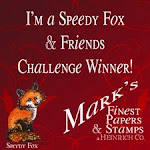 My take on the speedy fox and friends #173 I used the stamp set "Tweet Blessings" stamp set for the greeting mainly. I needed to send a friend a card for your new home and I like the inside greeting about love makes a home. This was a new technique for me. I like how the card turned out. I am entering this into Mark's Finest paper challenge . 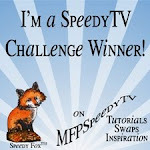 I used glitter Paper for the Friends of speedy TV #85 challenge. This a pretty bright card. I punch the flower and inside circle out of glitter paper and leaves too. The hummingbird is a retired stampin up stamp and the greetings from MFP the "Birthday Mini". I like inspiration challenges. I made these cards for the MFP inspiration challenge. The cross image stamp is embossed in silver it is hard to see on the photo. My Happy Birthday stamp is from Mark's finest papers stamp set called celebration mini. I took the cross pillows from the inspiration photo to make my cards. Today I was chosen to be featured on Mark's Finest Papers web site. 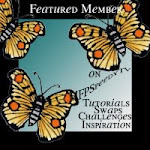 I have a lot of fun on this site taking part in the challenges and swaps. I hope you can check it out here. Please join me at this special place to share some great stamping ideas. I hope to keep everyone excited about stamping. Share your comments or questions. Come back again and again for more fun stamping ideas. I love to stamp. I find that when I am stamping cards, gifts and scrapbooking my stress level goes down. I have been stamping as a hobby for the past 8 years.